Overlooking Grant Park and Lake Michigan, Hilton Chicago has served as one of the city’s most revered addresses since 1927. Meticulously redesigned and restored, this historic Beaux-Arts hotel has preserved the magnificence of its early 20th century style while incorporating all of the luxury conveniences the modern traveler has come to expect. Appointed with over 1,500 guestrooms and suites, exceptional dining options, a 16,450 square foot athletic club, and an ideal location in downtown Chicago, the Hilton Chicago is both accommodating and convenient. With a celebrated history of hosting memorable events and over 234,000 square feet of meeting and event space, this Chicago landmark is the perfect setting to create successful affairs that make a lasting impression. 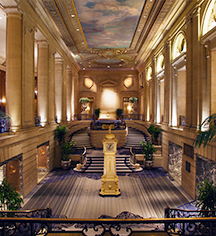 Hilton Chicago, a member of Historic Hotels Worldwide since 2015, dates back to 1927. In 1942, the U.S Army purchased the hotel for $6 million for use as barracks and classrooms for the Army Air Force during World War II. Adjoining Rooms: Available, based on availability. Early Check-In/Late Check-Out: Early Check-In Fee: $25 before 11 am. Early Departure Fee: One night room + tax unless otherwise contracted. Late Check-Out Fee: 12:00 noon - 2:00 PM $50.00, 2:00 PM - 4:00 PM $75.00. Hotel/Resort Fees & Taxes: Taxes: 16.4% accomodation tax. Parking: Self-parking: $61.00 for 24 hours (enter Hilton Chicago’s Parking Garage on Wabash Avenue or Balbo Street). Valet parking: $79.00 for 24 hours (available at Michigan Avenue and Balbo Street). Secured: Available. Covered: Available. In/Out Privileges: Available. Other Parking Information: Pay on foot stations available for self-parking. Payment: All forms of payment are accepted. Payment is required at time of booking. Visa, MasterCard, Amex, Diners Club, China Union Pay, JCB, Carte Blanche, Air Canada EnRoute, and Discover are accepted. Pet Policy: Service animals allowed: Yes. Pets allowed: Yes. Deposit: $50.00 (Non-Refundable). Maximum Weight: 75 lbs. Maximum Size: Large. Overlooking Grant Park and Lake Michigan, Hilton Chicago has served as one of the city’s most revered addresses since 1927. 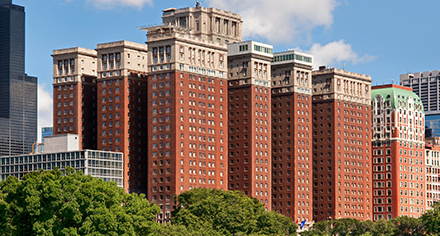 Learn more about the History of Hilton Chicago .